We had a warm weekend. It was lovely, and very muddy! The neighborhood kids had a great time; they had a snowball fight wearing shorts and t-shirts. I got a real kick out of that! I've been waiting to see my first robin. My daughter, at school in the Berkshires, has already seen some, but not me. I don't think I've even heard them yet. 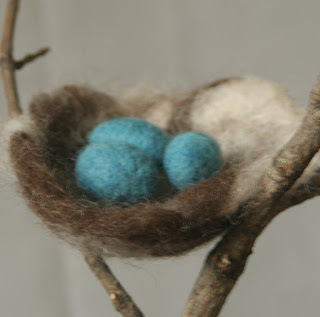 So here's a nest with some robin eggs, another felted wish. Let's see how long it takes to come true. Now the snow banks are gone, I've been out to inspect the garden. The garlic and other bulbs are sprouting, which always lifts the heart. But the heart sank when I looked at the blueberries I planted last spring - someone feasted on them over the winter. They've been cut off as neatly as if I went out and pruned them. Two of them are pretty tall still, so I think it must be deer, but I never figured deer would come to my back yard! It's mostly fenced in and the entrances are pretty narrow. Ah well, I hope it helped the critter survive the winter! You won't believe this! As I finished reading your comment on seeing the robin Sunday, I glanced out the window and saw 2 of them flying across the yard. My first robins! I can't wait for the market to open, either!